How do you know if the new prospect that has just contacted you is going to become one of your best customers, or a headache that will pay (IF they pay) only late and after sundry reminders and threats? In pre-Internet times, there was no quick answer: a translator could check with some trusted colleagues if they had heard of that particular agency, but that was about it. Later, translators started to exchange such information online, in an unsystematic way in bulletin boards and newsgroup. 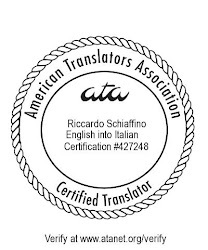 For some years, now, there has been something better: sites or list specifically devoted to collect information about translation agencies from translators, and make such ratings available (usually for a small fee) to other translators. There are three such services that I use regularly when checking new prospects (or even old customers that come back after a long absence): the ProZ Blue Board, TCR, and PP. There are other similar services, although, for some of them, it is difficult to assess their reliability (I'm thinking, for example of the Translation Directory "black list", since it is difficult to know what selection criteria have been used to add translation companies to this "black list"). There are also smaller free Lists and others that specialize in a specific country or language. To use most of these services there is a fee to pay, but it is well worth it. For the Blue Board (if you want to use it fully), the fee is the ProZ paid membership; same for the Translators Café area devoted to agency reviews (the "Hall of Fame and Shame). For the other two services, I use Payment Practices (PP) and the Translation Customer Review (TCR) list, the fee is respectively 20 and 12 dollars. A few pieces of advice. Pay attention to trends, if possible: two companies with an average rating may be different if the rating of one is improving and the other worsening, and a positive or negative rating may not be worth much if too old. (In many of these lists, however, it is possible to ask for more up to date information). Also, if the information is available, check how many people have rated the translation company: a rating that averages twenty responses is more informative than a single one. If the rating list shows who has given bad ratings to a company, try to verify the reputation of those translators: a bad rating given by a translator known to be unreliable may mean something different from the same rating given by someone who has a stellar reputation. Follow the rules set by the service, and don't abuse them. In particular, I believe that to threaten your prospect with something like "if you don't pay I'm going to give you a bad rating on XYZ board" is forbidden by these services' rules. In many jurisdictions this would be illegal (blackmail). Even if it worked, you would pay a disservice to your colleagues (a bad payer that pays only because threatened remains a bad prospect, and should be rated as such, to protect other translators). Try to see why a prospect has a bad reputation: you can probably live with someone who consistently pays late, if they are also known to pay always, eventually, and remember that normally it is better to get a customer that pays on time at, 45 days, than one who sometimes pays at 20, and sometimes at 90: you need to be able to plan your own payments. Beware that you can also err by excessive caution: we acquired one of our best customers a few years ago: they had found my name on the ATA site, and called to see if I was available for a big project. I checked them out: they were the successors of a company with a truly bad reputation... however, I had a good impression of the project manager who called me. I called her back with my doubts, mentioning the past reputation of the company. She explained that the company had recently been taken over by new owners, who were trying to overcome the bad impressions and practices left by their predecessors. I trusted her, and my hunch. We never regretted it. Fee: free for very limited access; otherwise included in Translators Café paid membership - $ 120 / year; unrestricted access is also available with any payment to TranslatorsCafé, starting with the $10 fee for credentials verification. Unrestricted access also available for free to active members, and upon special request to moderators, to those unable to pay. Please note that there may be other lists available, and that I have a less personal experience with the rating lists after the first free: for example, I could not explore the Translators Café list better, as my lack of a paid membership did not permit me to access it fully. I have updated this post with new information about the fee necessary to access the TranslatorsCafé "Hall of Fame and Shame"
Excellent post! Thank you. I'm having it linked on my blog. Thanks so much, it's really helpful to have all of this in one place. I just linked to this from my blog and sent it out to the students in my translation course. Ah, wonderful post. I wish I had read it before a U.S. publisher who specialises in legal books, twisted our e-mail only agreement to their benefit to not pay me the third draw for my work. In my 20 + years as a translator this had never happened to me. I learned the hard way that I will make sure we have all the terms on a signed contract. I hope this publisher does not rip off other hard-working professionals. Personally I have experimented the both situations: working in a translation agency (I used to work for Datawords in Britain) and as an independant translator. This experience in a translation company was a great opportunity to grasp how people work in such firms and I am more patient in some occasion now when I have to deal with difficulties concerning payment, etc. By the way : nice post(once again)! so many months have gone by, and this blog entry is still the best summary of the agency ratings lists available for translators. I think that companies, even the small ones, should use only translation companies, in order to benefit of quality services. I personally recommend Quicksilver Translate, it' s a small but dynamic company, we use their services and we are very happy to colaborate with them since 2006. Thanks for sharing this list Ricardo! it really helps.